It was the end of Fall when I made this. You know, steamy drinks, hot food, thermal leggings season? So could you blame me for thinking of something so fattening but delicious? Running to the store to get a giant container of Nutella was probably the best thing I could have done… because this recipe experiment turned out to be a success (hence why you’re now reading about it). This is probably the easiest and most decadent drink I’ve ever made. I mean all it requires is whole milk and a ton of Nutella. Oh.. and it’s probably the most unhealthy drink I’ve ever made too (no shame). So if you’re on a diet, then you should probably steer clear of this recipe (or maybe not). Seriously though, whether it’s the holidays, the beginning of the cold season, or you just feel like drinking something amazing, Nutella hot chocolate is the best drink for all occasions. Also, you can impress your friends and family, but they’ll have no idea that you just spent 5-10 minutes in the kitchen. The instructions are simple; place a medium sized saucepan over medium heat, and pour in 4 cups of whole milk. Once hot, add ¼ cup (or more if desired) of Nutella and stir until completely combined. That’s right, I’m not using tablespoons here, I’m using CUPS.. because it’s so worth it. Just remember not to drink a ton of it all in one sitting. Seriously.. you won’t feel so good. Oh, and don’t forget to top it with marshmallows, chocolate chips, nuts, and/or a Nutella drizzle (as seen in the pictures). The Nutella drizzle just consists of 3-4 tablespoons of Nutella and 1-2 tablespoons of cream (or half n half), combined over medium heat. And that’s it! Super easy, rich, creamy, and delicious. Now it’s time to sit by a fire or a window seat, bundle up, and have a cozy unhealthy drink. Pour in the whole milk and stir until hot, then add the Nutella and stir until combined. Heat the Nutella and cream (or half n half) in a small over medium heat. 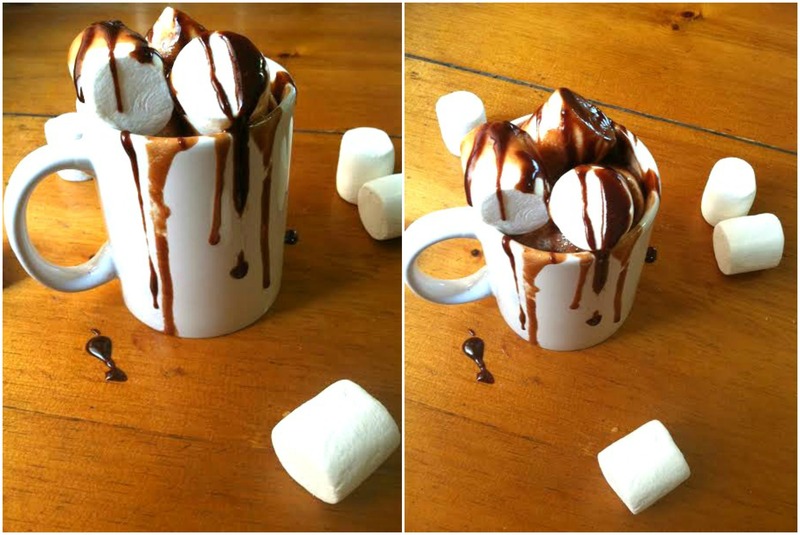 You can also use the same saucepan you used for the hot chocolate. Stir until combined and heated.